Yesterday's result is hard to take. In the last four years since the move to the Grove, I've been lucky enough to be at the ground to watch some wonderful games of football where we've won. Unsurprisingly I've also been there to watch some games where we've been beaten. But none of those defeats can be as hard to take as the performance of Arsenal Football Club's first team on Saturday November 20, from 12.45pm. Was it actually the first team? The names on the back of the shirts were familiar. The faces were familiar. However the performances from those 11 men who wore the red and white of Arsenal were not. They were players who should question whether they are good enough to wear the shirt. The first half performance would suggest they were. The game started but Arsenal didn't have a lot of the ball. Their passing was not quick enough. The tempo too slow. But then we got our foot on the ball and started to dictate play. We went ahead from a delightful piece of play which saw Cesc Fabregas from the halfway line play a perfect pass which Samir Nasri ran on to. The Frenchman took the ball around Gomes and finished from the acutest of angles. I don't know how he did it to be honest. I don't think I've seen a goal scored like that. It was brilliant. There was great joy around the ground. The mood was lifted further. The atmosphere was amazing. One of those games where when you walk into the ground the hairs on the back of your neck stand up. About 20 minutes later there was mayhem in the red and white sides of the ground as Marouane Chamakh doubled our lead. The striker wanting it more than Younes Kaboul to get something on the ball which took it passed Gomes. So we led at half time. It was going so well. But I said to my friend sitting next to me that we had to go on and score more. We needed another two more goals. I wanted it to be a rout. But when the players returned from the break it seems they thought the game was in the bag. Won. It appeared from watching them they thought the three points were in the bag. How wrong could they be? This is a derby game. One where either team no matter how many goals they are behind should give up. And that's what appeared to be the half time message given to the Spurs players by Harry Redknapp. 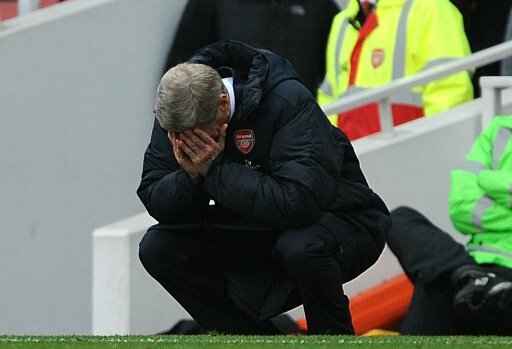 You would imagine that Arsene Wenger called for his players to repeat their first half performance. However the message didn't get through. They went out on to the pitch with an attitude which wasn''t one which fits with a winning mentality. No matter how many goals they were in front, they should have gone out with the attitude that they needed to kill Spurs off. The tempo wasn't fast enough. There was a lack of attacking urgency. It seemed the players felt intimidated to go on and put Spurs to the sword. But that's what we needed to do. However Spurs got back in to the game with a swift counter attacking move. From a corner at their end they punted the ball long and Jermain Defoe won the ariel battle with Gael Clichy. His knockdown reached Van Der Vaart who played in Gareth Bale. He placed his shot passed the out stretched hands of Lukasz Fabianski who had no chance. Their second goal came as a result of a penalty awarded after Cesc Fabregas lifted his hand to stop the ball going over the wall when he was defending a free kick. It was stupid from the captain. He didn't need to do it. It was rightly awarded a penalty. I would have been annoyed if a Spurs player did that and we didn't get a spot kick. The resulting penalty was duly dispatched into the opposite corner to the way Fabianski dived and Van Der Vaart had the boys from the white side of north London level. Were they lucky to have been awarded a free kick which led to the captain's moment of madness? Possibly. But had this Arsenal team pressed the ball and not invited the Spurs players to run with the ball towards our goal, we could have avoided putting in the challenge to win the ball back outside our area. It was just oh so disappointing. And then Arsene Wenger's unbeaten record at home against Tottenham in the league was tossed in the bin as they got their winner with four minutes of normal time to go. An Arsenal attacking move broke down at the edge of the Spurs box. They then launched a counter attacking move on us and when the ball was passed to Gareth Bale on the Arsenal left, Laurent Koscielny dived in on him and gave away a free kick and a booking. The ball was swung in, Fabregas and Van Persie sandwiched Kaboul but it was the Spurs man who won the ball and it found the back of the net. There was no way back. Arsenal's second half performance was woeful. There was not the commitment, passion or desire needed to get us back into this contest. It was not the fact that Spurs had won three points. It was that Arsenal had handed their neighbours the three points on a plate. I'll admit I was over confident myself at half time. But I knew that we needed to add to our advantage. There was no point in us trying to defend a two goal lead. We know this Arsenal side are not capable. There is not the type of player within the squad who would be able to shut up shop to bring on. The manager must take some share of the blame for the manner of our defeat but I will not say that this was his fault. They were his players on the pitch but he would not have foreseen the manner of their capitulation coming. This result is the hardest for me to swallow. We were all over them yet we cannot fight for a victory from a winning position. I can only hope that this result is a turning point in our season. That the squad come together at a team meeting and ensure this doesn't happen again. They gave up the fight before the final whistle was blown and that is not acceptable. We are Arsenal and our fans deserve more than a capitulation we got from yesterday's result. I just hope the players realise how much we are all hurting. Our closest north London rivals have come to our place and we have given them three points when what they deserved to take with them was nothing. I was there for the Newcastle and West Brom defeats and the Sunday after those two games I was sore. But I haven't ever felt so low following a loss like the one I watched yesterday. We need to pick ourselves up and ensure we never humiliate ourselves again in that manner. If it is manageable, lets go through the season now undefeated. A tough challenge but something which we could be capable if our players work hard enough for one another. A final point. At the end of the game the Spurs fans in the away end celebrated their victory like they'd won the league. It was galling. But Gooners never forget 1971 and 2004. We actually did win the league at their place.